One of the most momentous events to occur during the 20th Century was the December 7th, 1941 surprise attack by Japan on United States military installations located on the Hawaiian island of Oahu. 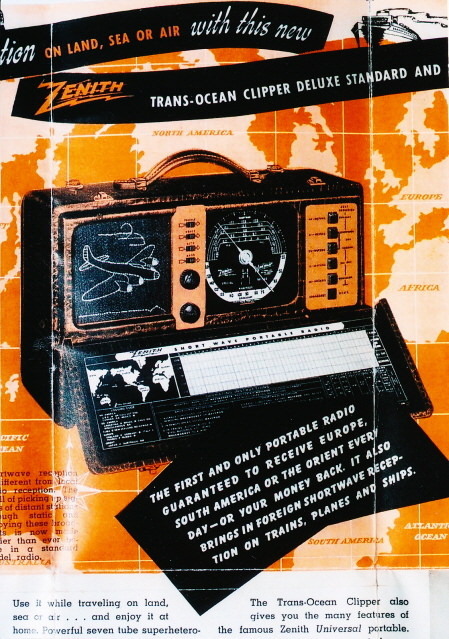 On that day, most Americans relied on radio to keep them informed about the latest developments in an unfolding crisis that everyone knew would result in war. 1:00 a.m. Radio Station KGEI in San Francisco reports that President Franklin Roosevelt “had sent or was sending a message to the Emperor.” [Japan’s refusal to withdraw its military forces from China and its threatening moves towards Thailand, Malaya and the Dutch East Indies had made war with the United States almost inevitable. As diplomatic relations with Japan continued to deteriorate, the President hoped that a direct appeal from him to Japanese Emperor Hirohito would keep hostilities from breaking until some sort of settlement could be negotiated.] In Tokyo, American Ambassador Joseph Grew hears the KGEI broadcast at 3:00 p.m. local time. 1:38 p.m. At 08:08 a.m. local time, KGMB interrupts its musical program with a special announcement ordering all Army, Navy, and Marine personnel to report for duty. 1:40 p.m. [The forward magazines on the battleship Arizona ignite, resulting in a tremendous explosion and fireball. She sinks within nine minutes. 1:45 p.m. At 8:15 a.m. local time, KGMB interrupts its music program with a second special announcement, ordering all military personnel to report for duty. 2:37 p.m. In Washington, CBS commentator Albert Warner reports that the White House has just announced that all naval and military activities on the principal island of Oahu in Hawaii have been attacked from the air. A Japanese attack on Pearl Harbor would naturally mean war, as there is no doubt that Congress would grant such a declaration. The White House has just reported that Army and Navy bases in Manila have also been attacked. [This report proved to be untrue. The Philippines were not attacked by Japan until December 8th.] Hostilities seem to be opening all over the Southwest Pacific. Japan’s two negotiators in Washington [Ambassador Kichisaburo Nomura and special envoy Saburo Karusu] are currently meeting with Secretary of State Cordell Hull. [The envoys had been instructed to deliver Japan’s ultimatum to Hull precisely at 1:00 p.m., which would have been 7:30 a.m. in Hawaii and prior to the attack beginning. Due to delays in preparing the ultimatum document, they did not arrive at the State Department until 1:45 p.m. By that time Hull had already been informed that the attack was underway. He did not admit them into his office until 2:20 p.m.] CBS in New York attempts to contact Honolulu and then Manila without success. CBS’ chief military analyst Major George Fielding Eliot speculates that the attack was most likely launched from aircraft carriers and that the attack was a “desperate attempt” to prevent the U.S. Fleet from intervening in Japanese military operations in the Far East. Japanese troop landings on Oahu are unlikely because of the logistics involved. [On these two points, Eliot’s analysis was essentially correct.] Calls for Honolulu police and firefighters to report for work might be an indication of some sort of uprising among the Japanese living in Hawaii. [There is no evidence that any sort of uprising by Hawaii’s Japanese population took place on December 7th.] From Manila, Ford Wilkins describes the military preparations that are taking place in various Far Eastern countries. (His report ends abruptly “due to line troubles.”) A report has been received from Singapore that Japanese troop transports have been seen moving into the Bay of Siam, heading for Thailand. Elmer Davis comments that one week ago, the Japanese had asked for two more weeks to negotiate a settlement over the situation in the Far East. In view of today’s events, this was obviously an attempt to stall for time and put the United States off guard. London has been “staggered” by news of the attack. Prime Minister Churchill has promised that Great Britain will declare war on Japan within the hour of the United States doing so. [Churchill was well aware that, by declaring war on Japan, the United States would also be going to war with Japan’s ally Nazi Germany, which the British had been fighting since 1939.] 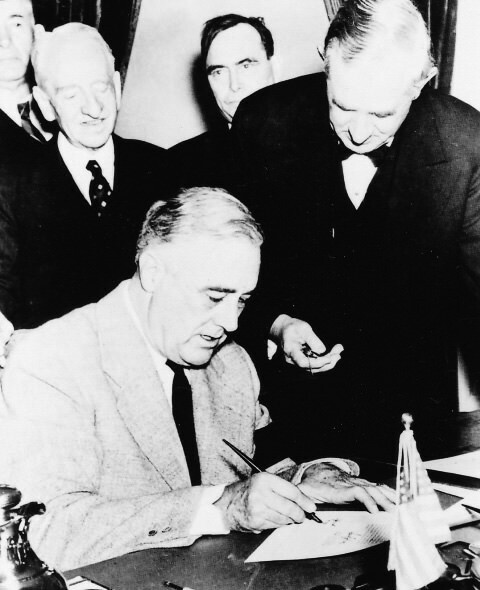 Congress will be meeting tomorrow and will undoubtedly be discussing the possibility of war with Japan. CBS’ affiliate station KGMB in Honolulu has reported that the air raid is still going on. 4:00 p.m. On the NBC Red Network, a sermon by Dr. Harry Emerson Fosdick is interrupted by an extended news update that includes a telephone report from a KGU correspondent in Honolulu. (During this report, a telephone company operator breaks in and asks the correspondent to get off the line for an emergency call!) From the White House newsroom, H. R. Baukhage reports that the President will address Congress tomorrow. The cabinet will be meeting at the White House tonight at 8:30 p.m. and will be joined by Congressional leaders of both parties at 9:00 p.m. It has been reported that 5 people have been killed in Honolulu. 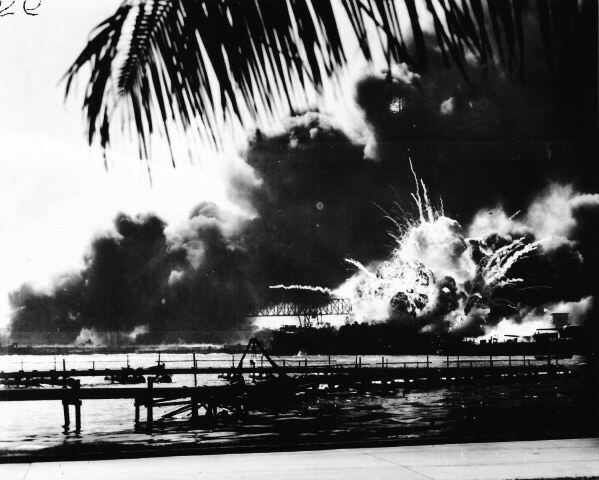 [It was later determined that most of the “bomb damage” that occurred in Honolulu was caused by unexploded anti-aircraft shells fired from Pearl Harbor, 12 miles away.] Germany had no immediate reaction to the attack. On the West Coast, all military leaves have been cancelled and military personnel have been ordered to report for duty. The FBI is “completely mobilized” to counter Japanese espionage. Beginning on Monday, all active duty military personnel are to report for work in uniform. [During the military build-up that occurred in the months prior to December 7th, military personnel serving in Washington and other major cities were instructed to work in civilian attire, lest the sight of too many uniforms create a “war scare” within the civilian population.] Portions of the message that the President sent to the Japanese emperor on Saturday afternoon, is read. Parachute troops have been sighted along the northern coast of Oahu. [Another false rumor!] Sailors in the New York City area are instructed to report to their ships. 4:30 p.m. NBC News on the Red Network: news of the attack on Hawaii was first reported in London by the BBC about an hour and a half ago. In San Francisco, NBC’s “expert on the Far East” Upton Close reports that the attack came as a complete surprise to the Japanese Consulate in San Francisco and might have come as a surprise to the Japanese Government itself. It is possible that these attacks were carried out under German influence and with German support, or by a small faction within the Japanese Navy that is trying to precipitate war. We cannot be sure as yet that the Tokyo government is behind it. Honolulu has reported that the attack has stopped. In Los Angeles, the sheriff has taken charge of Little Tokyo in order to watch for any Japanese “disorders.” If the Japanese Government is behind this attack, we are in for a bitter war in the Pacific. From KGU in Honolulu, a reporter gives a brief summary of events that are known to have happened so far. Considerable damage has been done to Hickham Field. Lines of communications between the various military bases seem to be down. 350 men were killed in a direct bomb hit on a barracks at Hickham Field. Bellows Field was also heavily damaged. A telegram from David Sarnoff [president of NBC] to President Roosevelt is read. It pledges that all NBC’s facilities are now available to him as needed. Affiliate stations are advised that NBC will remain on the air on a 24-hour basis during this emergency. 4:45 p.m.: At 11:15 a.m. local time, Hawaiian Governor Poindexter comes on the radio to announce a state of emergency. 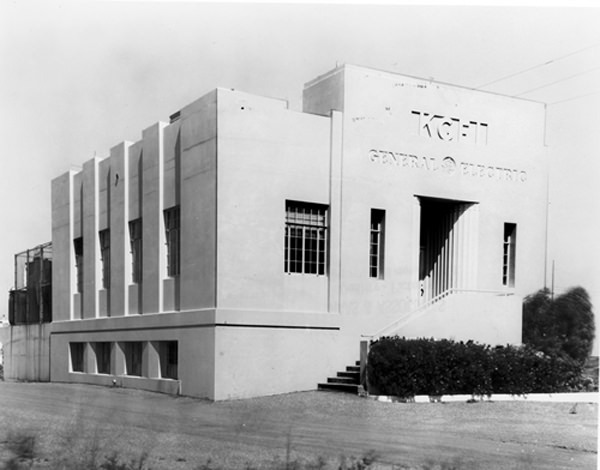 5:12 p.m. At 11:42 a.m. local time, the Army orders Honolulu’s commercial radio stations to go off the air. 7:00 p.m. NBC’s News Roundup on the Blue Network: via shortwave from London, Fred Bates reports that Japanese diplomats in London are burning their official papers. German radio has blamed the war on President Roosevelt’s “war mongering.” The NBC New York newsroom reports that the Secretary of Defense has instructed all U.S. companies involved in war work to take steps to insure that their plants are protected from sabotage. NBC facilities in New York and on the West Coast are being protected by special police squads. From the White House newsroom, H.R. Baukhage confirms that Manila has not been bombed. President Roosevelt is currently in his White House study, working on the message he will delivery to Congress tomorrow. Baukhage describes being present when news of the attack was first announced at 2:25 p.m. EST. When told of the attack, Senator Burton K. Wheeler, the leading isolationist in the Senate was quoted as saying, “We will have to see it through.” The broadcast switches to San Francisco for a shortwave report from Manila by Bert Silan. The Japanese military has announced that it is taking over the International Settlement in Shanghai. The U.S. Consulate in Shanghai has warned all Americans there to keep off the streets. In Manila, troops have been rushed to their battle stations. The Yokohama Bank in Manila is completely surrounded by armed guards with machine guns and sawed off shotguns to prevent sabotage. It is expected that Japanese bank officials will be taken into custody. All Japanese stores in Manila failed to open this morning. Plans are being made to evacuate non-essential civilians from Manila shortly. Schools were closed today and will probably stay closed. Manila is calm, and is confident that U.S. forces will protect it. [Cut off from any assistance or reinforcements, U.S. forces in the Philippines held out until early May 1942 before they were forced to surrender to the Japanese.] It has been rumored that Singapore has been bombed. In San Francisco, Upton Close reports that the Japanese Consul in Portland was surprised and unhappy when he learned about the attack. Attempts by the Japanese Consul in San Francisco to burn confidential papers in a fireplace that was more ornamental than practical resulted in the fire department having to be called in to put out the blaze, which had gotten out of control. 11:00 p.m. (NBC Red Network) News: from Washington, D.C., H. R. Baukhage describes talking with Congressional leaders as they emerged from the White House after meeting with the President. None of them would comment on whether or not the President will ask for a declaration of war tomorrow when he speaks to Congress at 12:30 p.m. EST. In Washington, there is almost a sense of relief, now that the “war of nerves” is over. In New York, Robert St. John reports that Canada has declared war on Japan. The Mexican congress will meet tomorrow to consider a declaration of war. There is an unconfirmed British rumor that Wake Island has been occupied by the Japanese. [Once again, this was a rumor with no basis in fact.] The Panama Canal Zone is on a full time war footing. In the U.S., all military leaves and furloughs have been cancelled. Armed troops are now guarding defense plants. John Vandercook describes Pearl Harbor as “not a place but a location.” The sprawling facility is “the most powerful maritime fortress in the world.” Vandercook then reports that Japanese troops have landed in Northern Malaya. 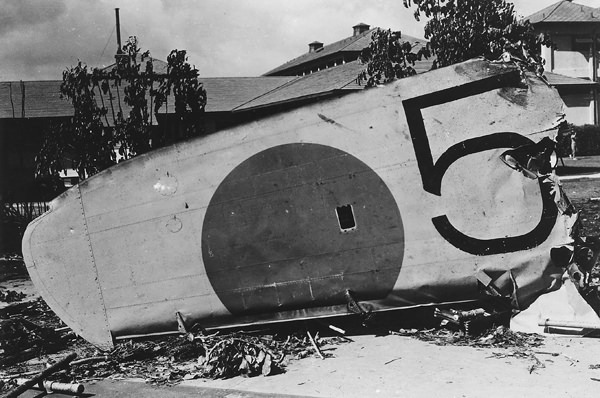 Two Japanese bombs fell on Singapore, but did little damage. Japan is now at war with about one-half of the world’s population. 11:30 p.m. On the NBC Red Network, Ben Grauer moderates a round table discussion between some of NBC’s top commentators, who are heard via 2-way radio, speaking from various locations around the country. It is now clear that the attack on Pearl Harbor was only part of a larger military move by Japan. There is speculation as to whether or not Hitler encouraged the attack, since a two-ocean war would benefit the Axis. 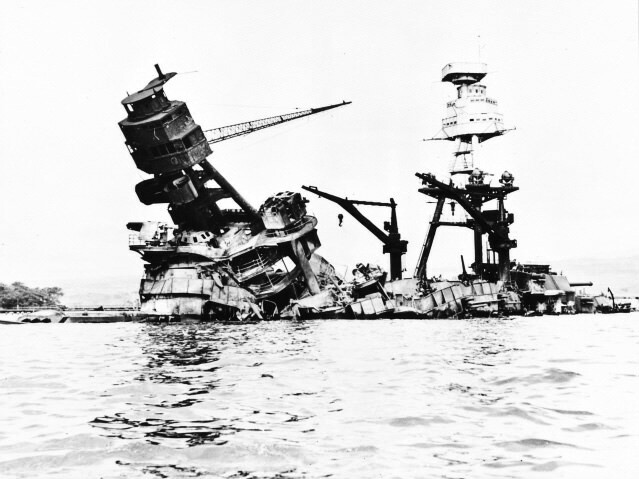 [There is no evidence that Germany encouraged Japan to attack Pearl Harbor.] It is believed that the President’s message to the Emperor never got through. Protecting the Panama Canal will now be of vital importance. The attack on Hawaii has ended all debate over whether or not the country should become involved in the war. There is speculation on whether the President will ask for a declaration of war just with Japan or with the Axis. 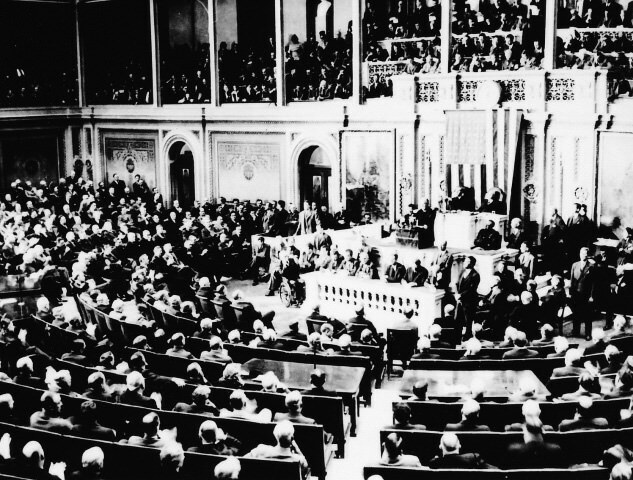 [The President’s message, delivered to Congress on December 8th, asked for a declaration of war on Japan only. However, it was generally understood that, as Japan’s ally, Germany would declare war on the United State, which it quickly did.] There is discussion as to how soon the U.S. Navy will go on the offensive against the Japanese Navy. [The commentators were still unaware that the Pacific Fleet had been devastated and that U.S. Pacific defenses were in shambles.] There is discussion on whether or nor Russia will declare war on Japan. [As noted above, this did not occur until August 8, 1945.] It is suggested that the Aleutian Islands could be used to launch bombing raids on Japan, since such raids would cause widespread panic among the Japanese people. [On April 18, 1945, sixteen B-25 bombers launched from the aircraft carrier Hornet, carried out the first air raid on Japan. Although the damage done was trivial, the psychological effect on the Japanese people was profound.] The commentators are in general agreement that, given its limited natural resources, Japan cannot possibly win a war against the United States. On December 8, 1941, in his famous “Day of Infamy” speech, President Roosevelt asked Congress to declare “that since the unprovoked and dastardly attack by Japan on Sunday, December seventh, a state of war has existed between the United States and the Japanese Empire.” Congress took only 33 minutes to approve the President’s request. Many military historians believe that Admiral Nagumo’s failure to launch the third attack wave against Pearl Harbor, and to find and sink the two aircraft carriers Lexingtonand Enterprise were factors that ultimately determined the final outcome of the Pacific war. 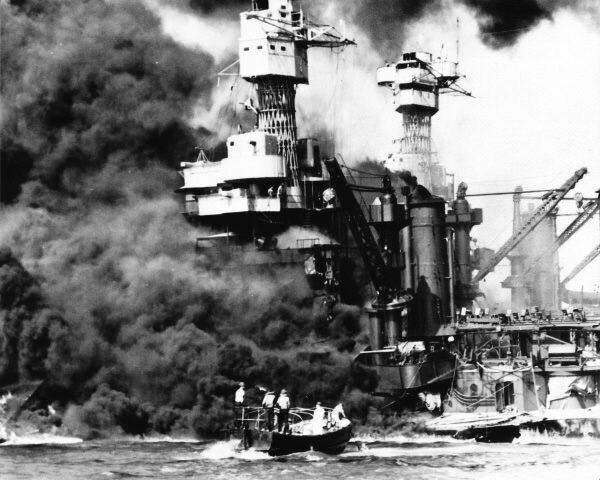 The undamaged Pearl Harbor shipyards began repairing damaged ships almost immediately. (Most all of them, including the destroyer Shaw, eventually rejoined the fleet and took part in the war.) Within days, repairs were made to bombed-out hangers and other installations, and Army and Navy airfields were back in operation in short order. 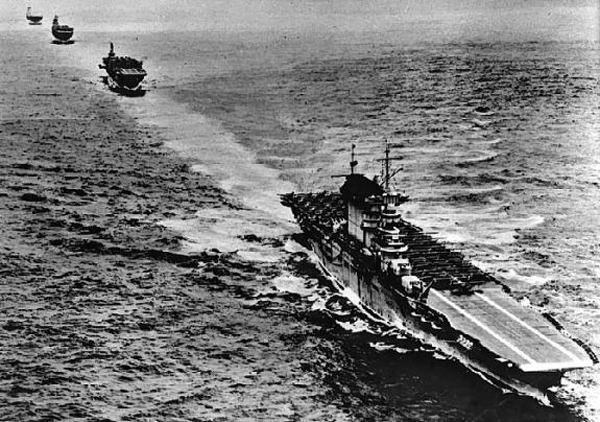 With most of the battleships out of action, aircraft carriers became America’s new first line of defense in the Pacific. 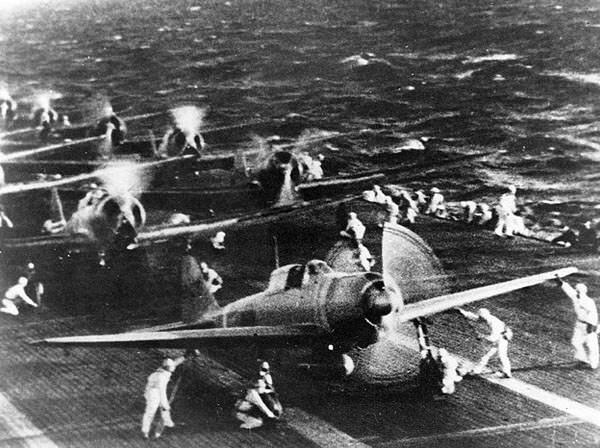 The effectiveness of their striking power was proven conclusively in June 1942 when carrier-based planes sank four Japanese aircraft carriers at the Battle of Midway. During that battle, which is generally considered the turning point of the Pacific war, Japan also lost a high percentage of its bravest and most experienced pilots. By mid-1945, and after a long and bitter struggle, Japan’s Navy and Air Force had been destroyed. Rather than sacrifice more American lives in an invasion of the Japanese home islands, President Truman authorized the use of nuclear weapons to force Japan into surrendering. Following nuclear attacks on Hiroshima (August 6th) and Nagasaki (August 9th), Emperor Hirohito announced unconditional surrender on August 14th. The occupation of Japan began on August 30th, and the official surrender ceremony was held in Tokyo Bay onboard the battleship Missouri on September 2, 1945. 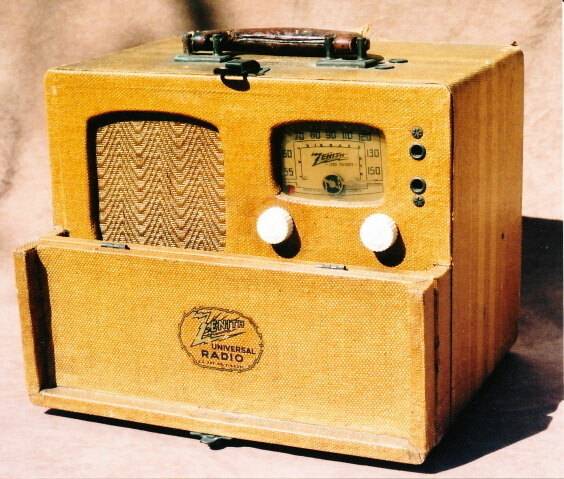 Most of the December 7, 1941 broadcast day was transcribed and is available in the MP3 format. Heard today, these recordings provide a unique opportunity to relive one of the most profound days of the 20th Century as it was taking place. Many fine books have been written about the Pearl Harbor attack. Two titles in particular that this writer can recommend are Dec. 7 1941 - The Day the Japanese Attacked Pearl Harbor by Gordon W. Prange, and East Wind Rain - A Pictorial History of the Pearl Harbor Attack by Stan Cohen. 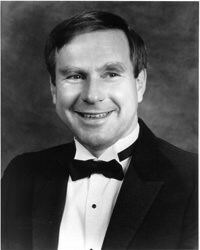 Eric Beheim is a life-long radio enthusiast. A former commanding officer of a Naval Reserve Combat Camera unit based in San Diego, he and his wife Pat live in Southern California..
Be the first to comment on "Air Raid Pearl Habor"